You may ask a question: “If I want to implement TOC without becoming an expert, is there a way?” And the answer to the question is “Yes”. Of course, it does not mean that you don’t need to learn TOC at all. You need to gain some basic knowledge about TOC and have a good understanding of the application that you are going to implement. Can this be done in a short time? Again, the answer is “Yes”. This is necessary, but not sufficient. After having understood the basics, you need a set of instructions about how to implement. And this is precisely the objective of the eBooks by Rajeev Athavale. do you have problems in delivering orders on time? is your lead time increasing over a period of time? do you have high inventory on the shop floor? 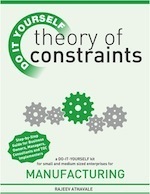 This Do-It-Yourself manual provides step-by-step instruction for implementing the Theory of Constraints’ application for Manufacturing. This entry was posted in Books, TOC Weekly 87 and tagged Buffer Management, DBR, Drum-Buffer-Rope, manufacturing, operations, Operations/Production, production, production management, theory of constraints. Bookmark the permalink.